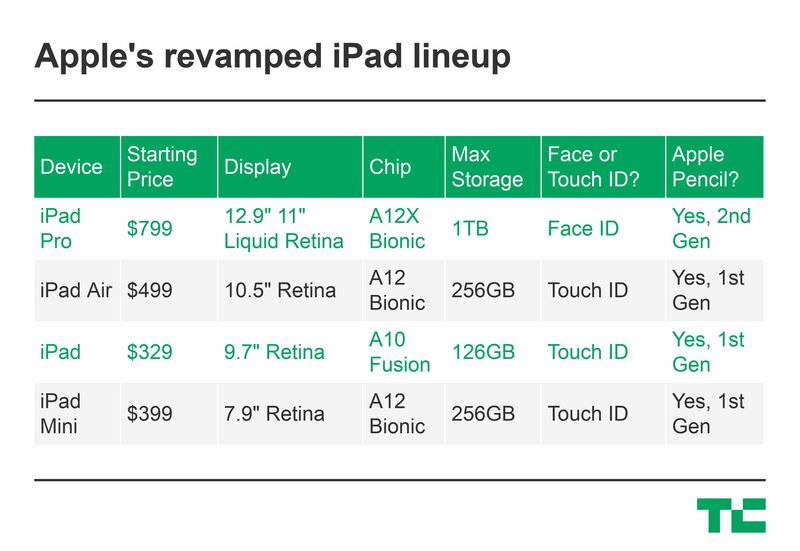 Apple has refreshed its iPad lineup. The company is (finally) updating the iPad mini and adding a new iPad Air. This model sits between the entry-level 9.7-inch iPad and the 11-inch iPad Pro in the lineup. All new models now support the Apple Pencil, but you might want to double-check your iPad model before buying one. The new iPad models released today work with the first-gen Apple Pencil, not the new Apple Pencil that supports magnetic charging and pairing. So let’s look at those new iPads. First, the iPad mini hasn’t been refreshed in three and a half years. Many people believed that Apple would simply drop the model as smartphones got bigger. But the iPad mini is making a surprise comeback. It looks identical to the previous 2015 model. But everything has been updated inside the device. It now features an A12 chip (the system on a chip designed for the iPhone XS), a 7.9-inch display that is 25 percent brighter, a wider range of colors and works with True Tone. And it also works with the Apple Pencil. Unlike with the iPad Pro, the iPad mini still features a Touch ID fingerprint sensor, a Lightning port and a headphone jack. You can buy it today for $399 for 64GB. You can choose to pay more for 256GB of storage and cellular connectivity. It comes in silver, space gray and gold.